The file locations in OBIEE12c are very different from previous versions. I'll update this page when I find something I consider interesting. I installed OBIEE and Weblogic under d:\MWHOME12. ORACLE_HOME would be the installation Directory. (In my case d:\MWHOME12\). 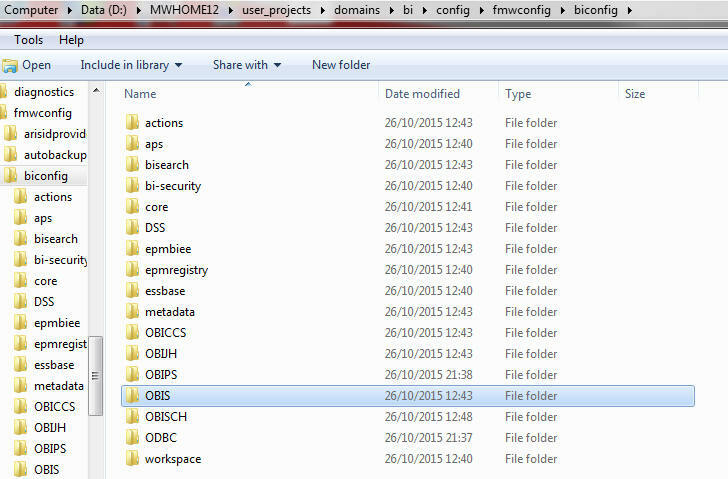 BI_DOMAIN, sometimes called DOMAIN_HOME is ORACLE_HOME/user_projects/domains/bi (in my case it is D:\MWHOME12\user_projects\domains\bi). 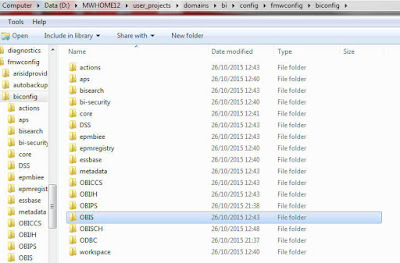 SDD (Singelton Data Directory) is DOMAIN_HOME/bidata (for one host installation). (In my case it is D:\MWHOME12\user_projects\domains\bi\bidata). (In my case it is D:\MWHOME12\user_projects\domains\bi\bidata\service_instances\ssi\metadata\content\catalog). The Repository is (sort of) in SDD/service_instances\ssi\metadata\datamodel\customizations (In my case it is D:\MWHOME12\user_projects\domains\bi\bidata\service_instances\ssi\metadata\datamodel\customizations). The entire handling of Repository and Catalog is different in 12c and is handled via BAR files. More about it later. 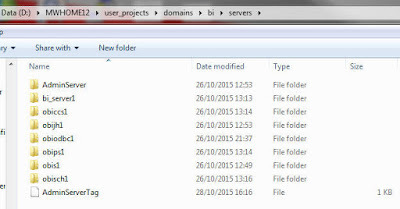 LOGS: Are in BI_DOMAIN/servers, each in his folder. For example sawlog.log is under BI_DOMAIN/servers/obips1/logs. All the logs are located in the same place, including Adminserver logs. Not only the logs are here. You will found tmp, cache and other folders as well. 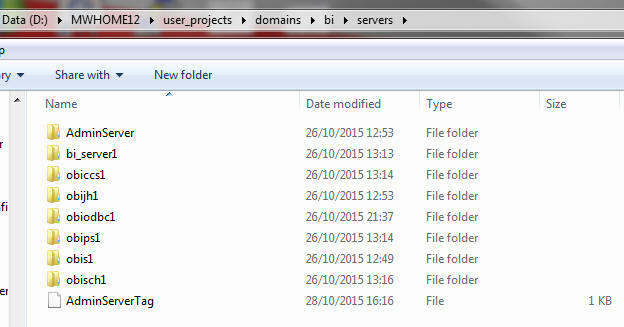 Most executable scripts are located in BI_DOMAIN/bitools/bin (D:\MWHOME12\user_projects\domains\bi\bitools\bin, in my case). The start and stop scripts are here and also the script that collects diagnostic for Oracle Support (diagnostic_dump.cmd for Windows and diagnostic_dump.sh for Linux). I have a question. Can I move only the catalog alone on a shared mount point so that I can access it from another stand alone OBIEE 12c installation.